When I was on my own for a time after my first marriage ended, I got accustomed to being in charge of making all the money decisions for my children and me. I have a good job and try to handle money responsibly. Many couples think that their brief money talks while getting to know each other will prepare them for marriage. Many of them soon discover that there is more to learn and know about each other when it comes to handling money. Having serious discussions about money can be even more important when couples blend their families. It’s a necessary prerequisite for them to discuss this important topic. Couples who remarry may bring ongoing financial obligations into the relationship. There may be money obligations to the former spouse or to children of the previous marriage. Sometimes couples come into a new relationship with previous financial baggage or burdens. For instance, a mother told me her daughter met a great guy with similar interests. The daughter said her boyfriend had a lot of debt, but that was okay with her. She had some debt, too. They were in love and that’s all that mattered. Both were actors, performing in plays and theatrical productions. The mother was concerned that her daughter and boyfriend didn’t have any serious plans to tackle their existing debt. She felt they needed a more realistic and complete picture of their financial situation before getting married. Sometimes couples aren’t fully aware or completely honest about their past financial history. It would be a good idea if, before the wedding, couples would get copies of their credit reports from the three major credit bureaus. This would help avoid any unpleasant surprises after the wedding. Couples may get along and work out their differences amicably. Or they may be unwilling to analyze their personal finances as a team. They may clash as though they are on opposite teams. Patterns of money management show one’s priorities and values. Individuals bring their money beliefs, habits, and history into the relationship. You and your spouse bring many different traits into a new family unit. The traits may include these typical behaviors: risk-taker or cautious, organized or disorganized, decision-maker or conformer, planner or spontaneous and impulsive, patient or impatient, cooperative or stubborn, saver or spender. Jennifer, if you didn’t talk about finances before the wedding, decide to do it soon. 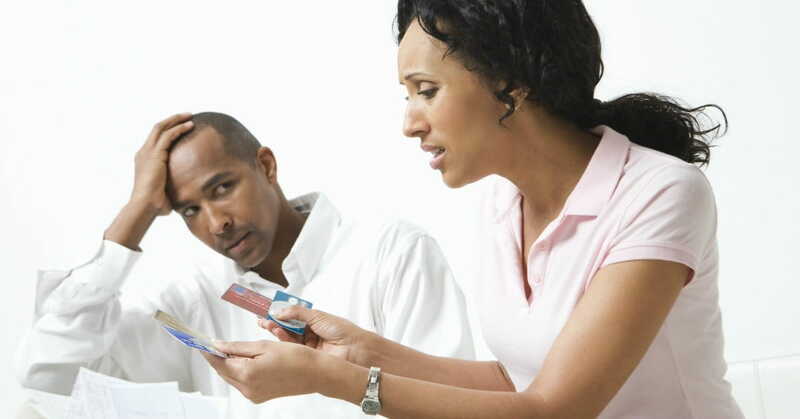 Ask your husband to set aside some time so you can discuss together how you are managing money as a couple. Resolve to work through the areas of conflict peacefully. Clarify your life values together. 1. Reveal everything about your own finances. Ask him to do the same thing. Examine your incomes, expenses, debt obligations, savings, and retirement accounts. 2. Relate your money concerns and talk about solutions that will help both of you meet mutual money goals. Discuss how each of you can make the most of your strengths and skills when it comes to money management. For example, in some families it is the women who fill out the tax forms and file taxes yearly. 3. Review the family incomes/expenses and set up a workable budget together. Have a spending plan in place. Have a mutual plan for paying off debt. Decide on another time in the next few months to revisit the family budget and make necessary adjustments. 4. Reassess the family spending plan together as often as necessary. Circumstances will change. As you work toward your financial goals together, seek to have a pattern of unity and understanding in your relationship.